Samsung says we could get the first commercial OLED laptops a year from now. Speaking at the official IFA launch of the X-Series and N-Series notebooks and netbooks, Kyu Uhm, Head of Worldwide Sales and Marketing for Samsung's Computing Division, said that the company would look to release towards the end of 2010. "Samsung is the largest OLED screen manufacturer. And as soon as it's available commercially for laptops we will adopt it," he said. After a hushed word from a colleague he added the reveal: "Probably sometime Q3 next year." That means a year from now we'll have OLED notebooks. Possibly. Patrick Povel, European Senior Product Manager, was quick to add that analyst Gartner believes mainstream OLED notebooks will become the norm over the next half-decade. 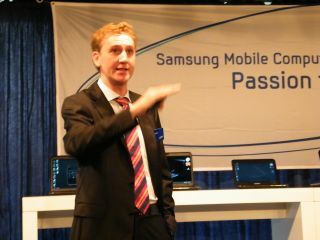 And Samsung is clearly set on the idea, having previously shown off an OLED prototype notebook. Povel had previously spoken about the PC becoming more personal than ever before, and that the days of one PC per household are gone. "We're moving towards one PC per person, the computer is becoming personal... the growth is coming from the low end," he added as he talked up the N-Series netbooks. He explained that the X-Series – powered by low voltage Intel chips – are the best compromise between power and mobility, and that customers had sometimes been disappointed by the lack of netbook power. "60 per cent of people don't know the difference between a notebook and a netbook," he explained, referring to a recent survey. "Why do they buy a new notebook? Because they're not satisfied with the performance." "The netbook car drives at 100km/h, some of our competitors drive at 150km/h. The target for [us is] 200km/h. "With the X-Series gone are the days when you had to choose between style and performance," added Povel. "The on-the-go user needs some better performance and larger screens."